How does a Corona Discharge Ozone Generator work? The heart of every ozone system is the ozone generator. 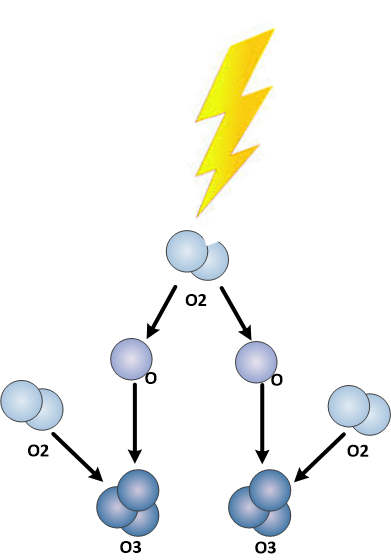 Ozone (O3) is created from Oxygen (O2) in nature and in ozone generators for commercial or industrial applications, however Ozone (O3) quickly reverts back to molecular Oxygen (O2). Ozone cannot be stored due to a short half-life and must be produced on-site and on-demand. Therefore, the ozone generator is the most important component of any successful ozone system. 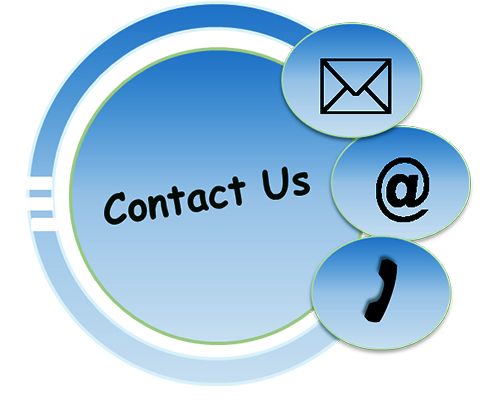 Industrial and commercial ozone applications use Corona Discharge ozone generators almost exclusively. There is an almost infinite number of variations to the fundamental corona discharge principle, and we will layout many of those variations in this article. However, the fundamentals of a diffused electrical discharge through a dielectric material to create a corona discharge to generate ozone will all be shared. Ozone is produced from electrical discharge, commonly referred to as a spark. 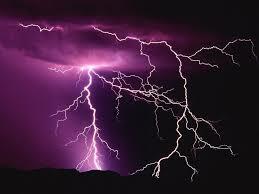 Great deals of ozone are produced from lightening during a thunderstorm. This is one of the reasons you smell the “fresh” smell after a thunderstorm. Any electrical discharge, or spark will create ozone. The spark will split the oxygen molecule (O2) found in ambient air into elemental oxygen (O). 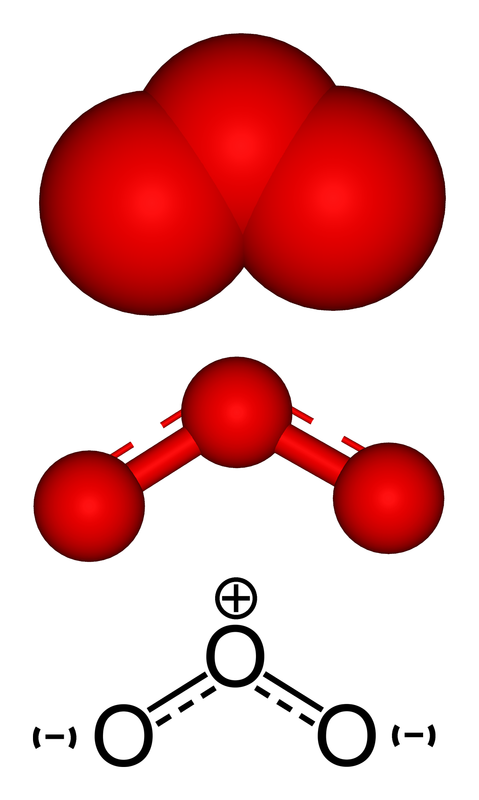 These Oxygen atoms will quickly bind to another oxygen molecule (O2) to form ozone (O3). 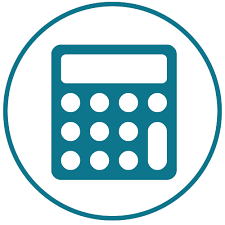 In actual ozone production the energy required to produce ozone will be 10 – 20 times the mathematical figures shown due to the ozone generation inefficiencies. 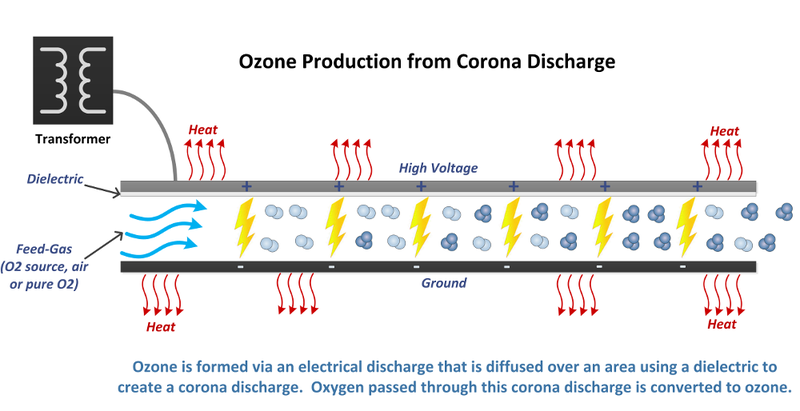 In a corona discharge ozone generator the electrical discharge will take place in an air gap within the corona cell designed specifically to split the oxygen molecule and produce ozone. In this air gap a dielectric is used to distribute the electron flow evenly across this gap to spread the electron flow to as great a volume of oxygen as possible. A single spark from an anode to cathode will find a few oxygen molecules in-between and will produce some ozone. However, if this spark is spread out over a greater area, more oxygen molecules will be contacted. This is the reason for the dielectric barrier used in an ozone generator to create a corona. Using a dielectric the spark is spread over a greater area and creates a true corona. To push the electrical discharge through the dielectric material a higher voltage is required. Therefore, an ozone generator will implement some type of transformer to increase the voltage from line voltage up to 600 – 20,000 volts depending upon dielectric, and air gap between the anode and cathode. Using this high voltage corona discharge as oxygen molecules are passed through the gap between the dielectric and the anode or cathode ozone will be produced. These are the fundamentals of corona discharge. Below we will examine the common components used in these ozone generators and the benefits of each. Creating a corona discharge with high voltages and great deals of energy to push through a dielectric barrier will create great deals of heat. In every corona discharge ozone generator heat will be created that must be removed from the ozone generator. Corona discharge ozone generators can be either air cooled or water cooled. In either case the excess heat must be safely removed from the corona cell as ozone production will be reduced with excess heat due to the decreasing half life of ozone as the temperature increases. Ozone is produced from oxygen. Oxygen is present in our ambient air at a level of about 20%. Using air to produce ozone will work and will produce ozone from the oxygen in ambient air. However, if a higher concentration of oxygen is used, more ozone will be produced. Many ozone generators will implement an oxygen concentrator to increase oxygen levels in the feed gas and increase overall ozone production. With either air or oxygen feed-gas it is extremely important that this air is perfectly clean and dry to eliminate the potential of creating dangerous by-products during ozone production. Corona discharge ozone generators are called many things based on the small differences between them. Names like “cold plasma”, “plasma generator”, “cold corona”, and many others have been coined. In the end, these are all variations of the fundamental corona discharge ozone generator. Corona cell to house the dielectric and provide the anode and cathode for the corona to originate from, and to pass to. Corona cell may house a dielectric that is a flat plate, or conical tube.